We’ve updated two of our most popular garment decoration products. DarkJET has a slightly new look. DarkJET Solvent has been on hiatus, at the media spa, getting a makeover. They’re both back, feeling refreshed and ready for duty. EnduraTex DarkJET and DarkJET Solvent are made for the application of heat-applied graphics to apparel of any color. Despite the name, DarkJET isn’t JUST for dark garments. 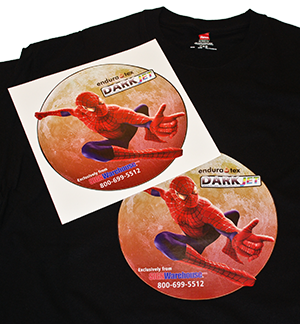 DarkJET was so named because so many of our customers want to apply their printed graphics to dark and/or colored T-shirts. Dye sublimation and Sawgrass’ ChromaBlast inks are limited to use on white and light colored fabrics. DarkJET and DarkJET Solvent are print-and-cut films that give garment decorators an inexpensive way to apply vivid color to dark shirts. Why are there two of them? What are the differences? Which one works for you? Read on. Simply put, DarkJET is a white adhesive backed inkjet media that can be printed with any standard aqueous (dye or pigment, water-based) printer, then heat applied to a shirt. DarkJET comes in sheets conveniently sized for most desktop inkjet printers. DarkJET Solvent is a thin, matte white, polyurethane adhesive-backed film designed for use with solvent, eco solvent and thermal resin printers. DarkJET Solvent comes in 24″ rolls. Both are thin and flexible and produce an imprint with a soft hand. Although not quite as soft as sublimation or ChromaBlast, these are among the thinnest heat applied films available. Neither requires reverse printing or a special heat press. DarkJET sheets can even be applied with a household iron. DarkJET sheets come in letter (8.5″ x 11″) and Tabloid A3 (11.7″ x 16.5″) sizes. A pack of 50 letter sized sheets is yours for only $49.95. To help you get started creating affordable imprints on dark shirts, here are some tips on printing, cutting, and applying DarkJET and DarkJET Solvent. Printing: Use printer settings for high quality matte photo paper. If you have a profile or imaging configuration for ColorJETTM, this will work perfectly. Print right reading – not reversed. The product works more like sign vinyl than laser transfer or sublimation. Think of it as a soft vinyl decal for a shirt instead of a sign blank. If you’re loading a stack of sheets, fan them to eliminate static electricity before feeding through the printer. The initial print may have a muted look with a little less color saturation than desired. Don’t be alarmed. The color will become more vibrant after the transfer is heat applied to the garment. If you want to tweak your software or printer drivers to optimize color, do so based on the heat applied result, not the initial print. Remove the release liner. This can be done by hand, but it’s much easier with heat transfer tape. Heat transfer tape works with DarkJET just like application tape does with sign vinyl. It removes the vinyl from the release liner after it’s been cut and weeded and allows you to transfer it to the substrate. Place the printed DarkJET graphic. Cover with a Teflon sheet. (You may want to add a sheet of clean copy paper under the Teflon. Using a Teflon sheet directly applied to DarkJET printed image may produce a somewhat mottled look as the Teflon’s texture slightly embosses the ink.) Press @ 350° F for 20 seconds. Allow to cool and remove the sheet. By the way, you can use DarkJET sheets with Sawgrass ChromaBlast ink in a RICOH or Virtuoso SG400 or SG800 printer. This allows ChromaBlast users to add a dark garment solution to their super-soft cotton decoration system. If you don’t have a Virtuoso printer yet and would like to have the best of both worlds, take a look at our ChromaBlast – DarkJET print and cut package. It equips you to decorate light and dark garments for under $1,500.00. Cutting : For contour-cut decals, you will need to print the image with registration marks to be cut in a vinyl cutter equipped with an optical registration mark sensor, (such as a Vinyl Express Qe6000, a Roland GX24, Graphtec CE6000-40 or CE6000-60). Set the cutter for approximately 70 grams of force. If you’re using a Vinyl EXPRESS, Qe6000, Q Series, or Graphtec cutter, set the force to 11. 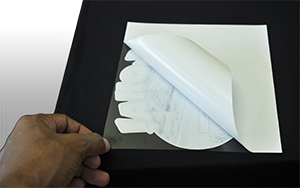 Perform a test cut to make sure you are scoring the surface, but not penetrating the release liner, just as you would with adhesive backed vinyl. Weeding, Masking and Transfer: A quick and easy way to begin the weeding process is to tear a corner of the sheet. Then just grab the face film and peel. The adhesive is heat activated, so once you get a handle on it, removing the excess face film is quite easy. DarkJET can be applied to the garment by hand, or by using application tape. If applying by hand, simply peel decal from the liner, and take care to lay the appliqué smoothly on the garment. Then cover with copy paper and a Teflon sheet as noted above. FIG 1: Be sure to remove the release liner before pressing. If you want to use tape to transfer the graphic from the liner, we recommend a heat transfer tape such as Siser TTD EasyMask or ATT500 or 600. ATT 600 is a high tack heat transfer tape. EasyMask is a medium-tack heat transfer tape. Why not use standard application tapes? High tack paper tapes will work, but they don’t remove the film from the liner consistently. And they tend to leave visible adhesive residue on the shirt after removal. Clear tapes such as R-Tape AT60 will MELT on your heat press. Do not use them for garment decoration. Some tapes, such as ATT600 have a liner that must be removed. Cut off a section of tape larger than your transfer, remove the liner (Fig 1). Then squeegee the tape onto the print moving from one side to the other to avoid getting bubbles or wrinkles in the tape. Once the heat transfer tape is smoothly applied, flip the masked print over and remove the DarkJET release liner. Pressing : Pre-press the shirt for a few seconds @ 350° F to eliminate wrinkles and remove excess moisture. Cover the masked graphic with copy paper and a Teflon sheet and press @ 350° F for 20 seconds with medium pressure. After pressing, immediately remove the Teflon sheet. Allow the shirt to cool to room temperature. Slowly remove the heat transfer tape, peeling it back along the surface at a 180° angle. For optimal adhesion, cover with a Teflon sheet and copy paper and repress for 3 – 5 seconds to reset the adhesive. When you remove it, stretch the shirt a little to help set the film into the fabric. DarkJET Solvent is available in 24″ x 50 foot, and 50″ x 50 foot rolls, and 24″ x 10 foot sample rolls. The 10 foot rolls can be had for the paltry sum of $24.99. The process for printing and cutting DarkJET solvent is the same with a couple of minor differences. Printing: Do not use DarkJET Solvent with water-based (aqueous) printers. It is not inkjet coated. It works with solvent, eco solvent and thermal resin printers only. If you’re using a solvent or eco solvent printer, use an ICC Profile for matte vinyl and set the heaters to 30°C. Printers with adjustable head heights should have the head set in the low position. PrismJET VJ24 users will find a DarkJET ICC profile in the Windows driver. DarkJET Solvent has a matte finish that doesn’t change after it’s pressed. So you can make adjustments based on the output from your printer without having to heat-apply it first. Cutting & Pressing: Cut using about 80 grams of force or the equivalent setting for cutting 2 mil cast vinyl. Qe, Q series, or Graphtec cutter users should start with the force at 11. After cutting, tear the corner to begin weeding. Transfer by hand, or mask with heat transfer tape, as indicated above. Press at 375° F with medium pressure, for 25 seconds. Allow to cool, and remove heat transfer tape. Cover with Teflon sheet and copy paper and repress to optimize adhesion. DarkJET: DarkJET transfers should last through 20 – 30 wash cycles with proper care. It is recommended that you wait at least 24 hours after the initial imprint to launder the garment. For the initial wash, turn the garment inside out and wash separately in cool water. Immediately remove from washing machine and put in the dryer on warm setting. Leaving the garment in the washing machine wet for extended periods of time may cause ink to bleed. Never use bleach. Do not iron the transfer. DarkJET Solvent: DarkJET Solvent imprints are as durable as screen printed images and should last as long as the garment if properly cared for. Wash inside out on delicate setting, tumble dry on low heat. Do not iron the transfer. Now that you know how to use it, you can make lots of stunning (and profitable) decorated garments using DarkJET or DarkJET Solvent. If you have application questions, please ask them in the comments below.